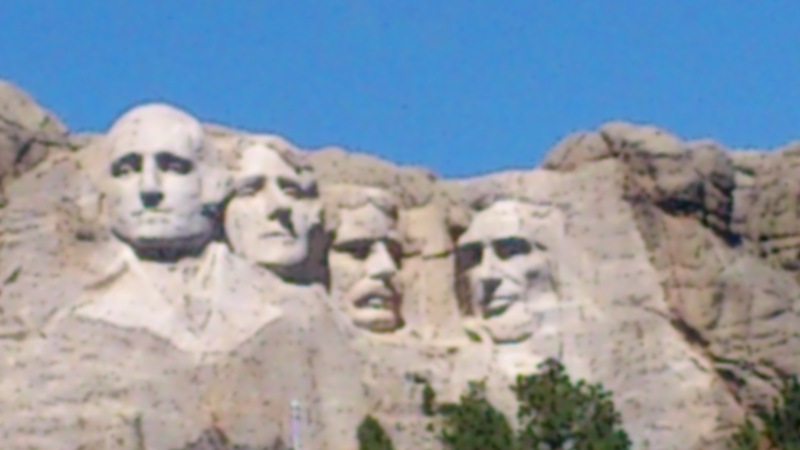 Days 12 started off early in the morning as we departed Rapid City, South Dakota towards seeing the great monument of Mount Rushmore, where the presidents of George Washington, Thomas Jefferson, Theodore Roosevelt and Abraham Lincoln are sculpted into the mountain. Driving through Keystone, South Dakota, a small tourist attraction town, we stopped off for some All-You-Can-Eat Breakfast at Keystone Family Restaurant, did some souvenir shopping, and off we went up the mountain drive to reach Mount Rushmore. Since 1941, this national memorial has been a popular attraction in the South Dakota hills. Situated in Keystone, South Dakota, it costs $11 for cars to park and venture near the monument to take photos. We managed to pull over on a small side of lookout point for a quick minute to take some photos. From Mount Rushmore, it would take another 6 hours for us to get to Denver, Colorado, our next major stop of our trip. We made a detour in Custer, South Dakota. 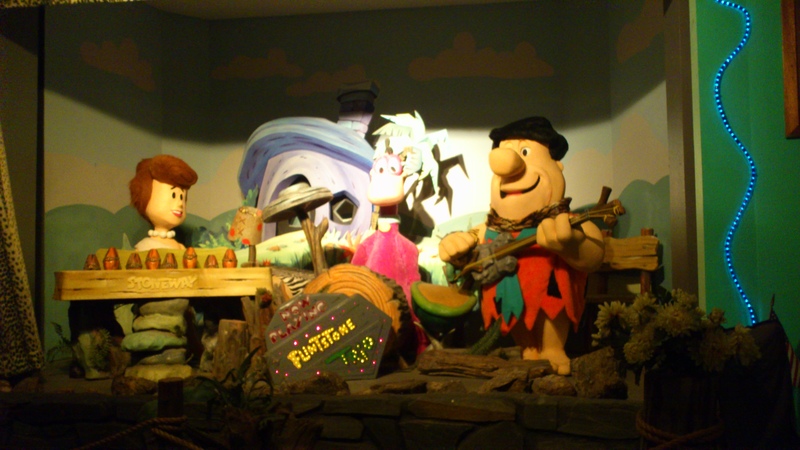 We saw that there was a Flintstones Park there so we had to pay Bedrock City a visit! Since 1966, this park had been an iconic pit stop for kids of all ages. It is $10 for admission but allowed you to take a train ride, ride a Flintstones car and walk through Bedrock City. We got to meet Barney and Fred! We managed to arrive at our hotel in Aurora, Colorado before dinner time. 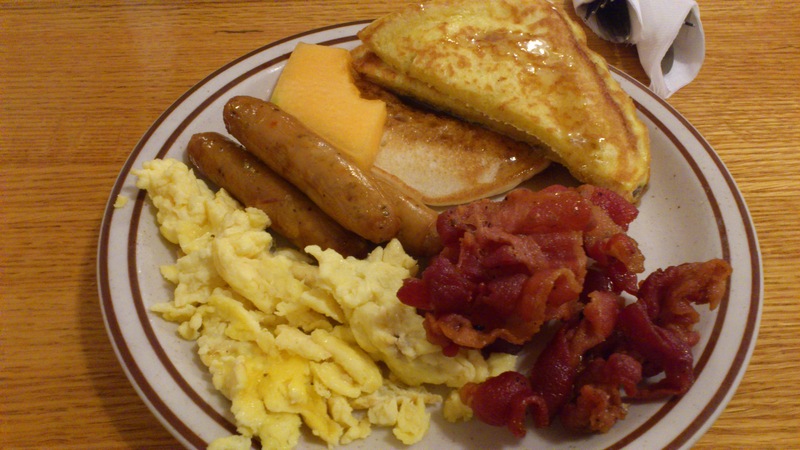 As per recommendations from UrbanSpoon, we found a diner called Jus Grill close to the hotel. 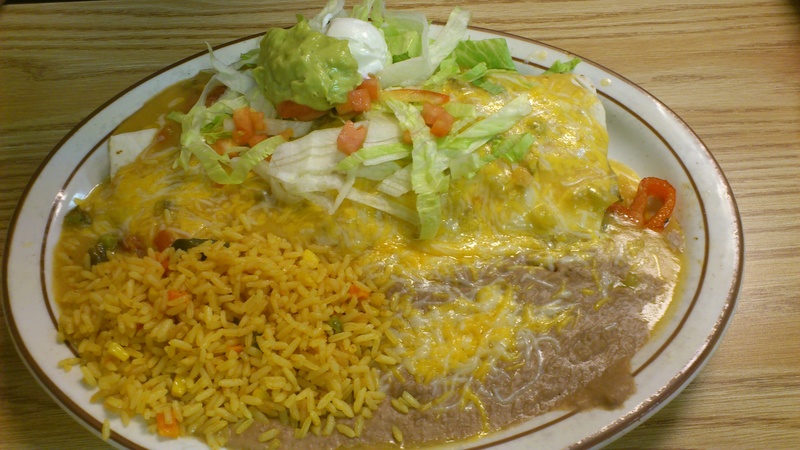 It was rated one of the top Mexican restaurants in Aurora. This place had a huge menu of all-day breakfast items, lunch sandwich/burger specials, and dinner entrees that included chicken fried steak, grilled salmon, and a whole page of Mexican entrees. 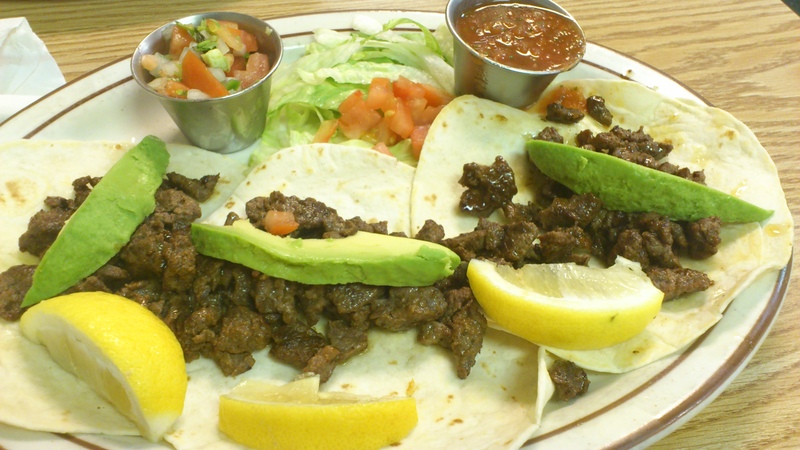 I ordered the Asada tacos, grilled steak on soft tortillas with pica da gallo and avocadoes. My bf ordered the Fajita Burrito plate (with grilled steak meat). Both were really delicious and the portions made us regret ordering two dishes when we should have shared one. Looking around at the restaurant, several people were ordering breakfast skillets – if we ever venture back, we’ll have to try one of those! Luckily we finished both plates and took a walk around Walmart afterwards before we called it a night. The next morning, Day 13, we decided to head to Hammond’s Candies factory for a tour of the factory to see how the famous ribbon candy is made. The tour is free and a great way to find out how candy canes and ribbon candy is made by hand. This location has been featured in Food Network’s Unwrapped TV show. Be forewarned, you will leave buying something! We bought a whole bunch of candy canes and taffy, as well as their famous Mitchell Sweets (vanilla caramel marshmallows). This is for a kid of all ages to enjoy – they also give you a sample to take home after the tour! We then ventured downtown to check out the Capitol building, which looked very similar to that of other capitol buildings in the states. 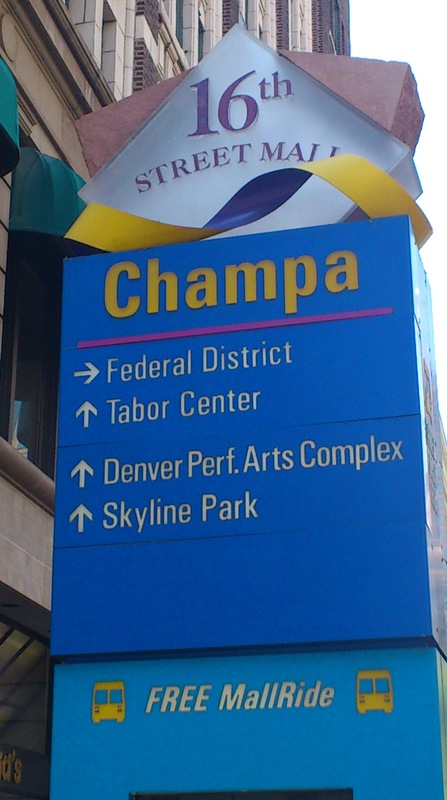 We also walked, ate and shopped along 16th Street Mall, the heart of where everyone was on a sunny Saturday afternoon. 16th Street Mall is a pedestrian and electric bus only street, filled with shops, food carts and restaurants, and for this weekend we were there, local artists and vendors selling handcrafted goods. They offer a free electric bus that goes up and down the street for those tired of walking down the street after all the shopping and eating. This weekend there was also a music sound stage setup, promoting local Denver musical artists! While we were there a local rock band was playing. We used the bus on the way back up the street so our feet thanked us! 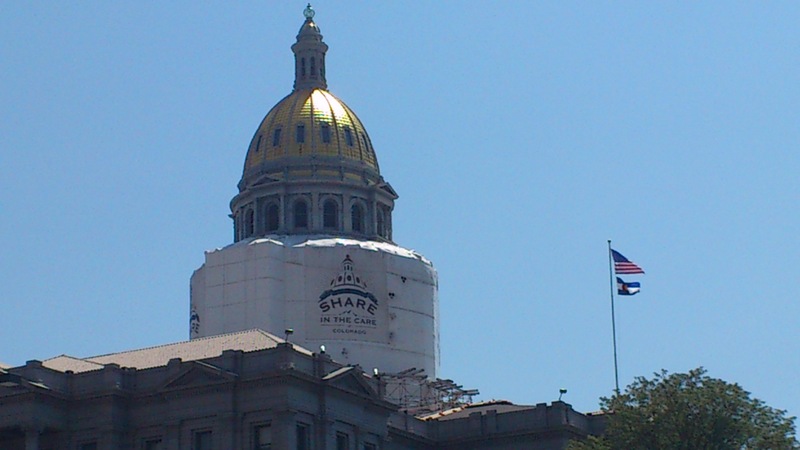 We then drove around the LoDo (Lower Downtown) district, along Larimer Square, which is the equivalent of Vancouver’s Gastown or Yaletown areas. This area was full of restaurants and bars and lots of boutique shops. Getting a bit hungry, we then ventured to one of Denver’s top rated UrbanSpoon restaurants, The Cherry Cricket. Located in its Cherry Creek district outside of downtown Denver, The Cherry Cricket has also been featured on Man Vs. Food and various television shows and magazines. It’s famous for it’s custom burgers and large menu of beers on tap. When we arrived we were quite hungry. 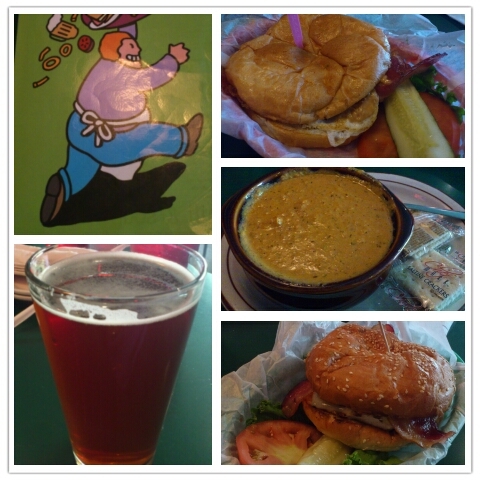 I ordered a beer, as it was happy hour, along with their special soup of the day, the Spicy Tomato Bisque. My bf ordered a side salad to start. Our server, Jason, was outstanding and was really helpful in assisting us with our orders. He was quick and the overall service of the restaurant was superb! Even though it was really busy, our food came in a very timely manner. I then went on to order the Alice Chicken Sandwich. Yes, I had to as it had my name on it! Loaded with bacon strips, grilled chicken, mushrooms and cheese, and topped with honey dijon sauce, this sandwich was quite juicy and tasty. I loved the charbroiled flavor of the chicken breast. My bf ordered a custom cricket burger, the one recommended by our server Jason, featured on Man vs Food. It was a 1/4-lb patty, with a fried egg, bacon, and peanut butter! An odd combination, but boy was it delicious! The sweet and savory makes it something I’m going to start trying at home – peanut butter and fried egg! We were beyond stuffed after eating everything – considering my burger was more than half the size of my face! Next time we’re in Denver, we’ll come back and try their fries as well. People were ordering baskets of their steak fries and looked quite delicious! We ventured over across the street to Cherry Creek Shopping Center, the fanciest mall in the city housing Neiman Marcus, Nordstrom, Louis Vuitton, and other brand name retailers. We didn’t buy anything but liked to look at the fancy Prada shoes at Nordstrom! After walking off our stomachs, we ventured back to the hotel for some R&R before another 7 hour drive tomorrow towards Santa Fe & Albuquerque, New Mexico!